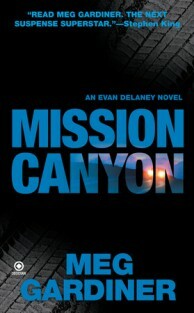 Mission Canyon is the second novel in the spell binding Evan Delaney series! While bicycling in the foothills of Santa Barbara, Jesse Blackburn and his friend Isaac are struck down by a hit-and-run driver. Isaac is killed, but Jesse survives. Now he wants revenge, and his fiancée, Evan Delaney, wants justice. Neither is simple. Evan and Jesse underestimate the power of the person with whom they’re dealing, and of the dark places where retribution will take them. As witnesses to the crime start dying one by one, it is apparent that no one can stop the killer – least of all Evan, who’s next on his list.